If you thought Victoria Harbour was a dazzling cityscape on its own, hang around for A Symphony of Lights. The multimedia show has set the harbour ablaze every night since 2004, and is recognised as one of the world’s most spectacular light shows. It has become the signature icon for Hong Kong, showcasing the vibrancy and glamorous night vista of the city. A new edition of the show was unveiled in December 2017, with even more exciting elements and a new soundtrack performed by the Hong Kong Philharmonic Orchestra. Iconic buildings on both sides of the harbour unite to form a harmonious canvas for a sensational multimedia extravaganza, with a myriad of searchlights, lasers, LED screens and lighting working in symphony to put together a nightly spectacle that transforms the Hong Kong skyline into an outdoor audiovisual feast. You can listen to the show's music at the harbourfront areas near Hong Kong Cultural Centre in Tsim Sha Tsui and near Golden Bauhinia Square in Wan Chai every night at 8pm. Or, download the show’s new mobile app to tune in to the music anywhere you like! 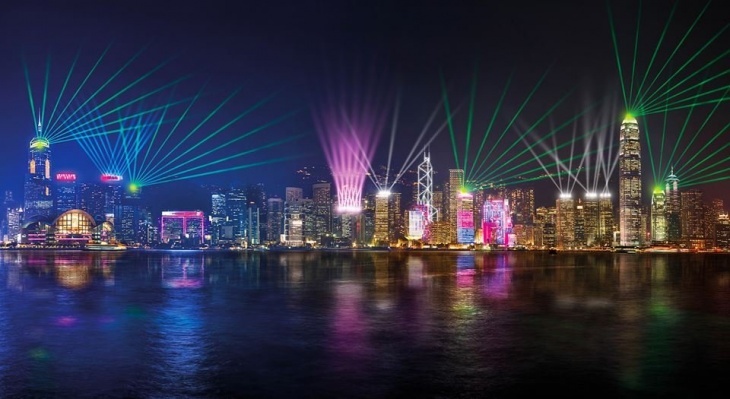 Don’t miss the mesmerising Hong Kong Pulse Light Show that starts right after A Symphony of Lights. Tsim Sha Tsui Promenade outside the Hong Kong Cultural Centre: MTR East Tsim Sha Tsui Station, Exit L6. Follow the signs and walk for around five minutes.